As the Nazi war machine continued to dominate in World War II the Soviet Union’s forces were getting pushed farther and farther back. Hope began to dwindle down as the German forces continued to win decisive victories over the Soviets. As Hitler’s confidence grew, so did his ego. Instead of focusing his army to the oil fields in Baku, which were a necessary fuel source for the Soviets, Hitler commanded that his forces be sent to siege the city of Stalingrad. Hitler viewed that taking a city that bore the name of the enemy would demoralize the Soviet army and humiliate Joseph Stalin. This would prove to be a fatal mistake for the egotistical Hitler. Eventually it reached a point where the Russian soldiers decided to go for one last hail mary offensive. On November 19th under the leadership of General Zhukov the Soviet soldiers went on the counter offensive. With an estimated one million soldiers Zhukov organized to attack the Germans from the East and West pinching them in the middle. The offensive was highly successful for the Russians as after a few days of skirmishing, the German forces had to surrender. It is estimated that approximately of the original 400,000 soldiers 110,000 of the Nazi forces were forced to surrender after the counter attack was concluded. After the surrender of the German forces in Stalingrad, Russian forces began to steamroll their way into Germany, eventually taking the capitol Berlin. The Battle of Stalingrad was the turning point in the war for the Soviet Union but at a great cost. Approximately 750,000 Russian soldiers were killed or wounded in the battle. The city itself was practically destroyed and reduced to rubble. Without the brave soldiers and wisdom of General Zhukov the Soviet Union would not have maintained possession of Stalingrad and could have potentially fallen under the control of the Germans. I think one of the most important reasons for Soviet victory was the sheer size of their army. Without the millions of men and being able to throw their soldiers at Nazi bullets I don’t think the Soviets would have won. It is hard to win a fight against a million plus men in their country while your army is run down and cold. I would have assumed that this order would have caused dissent among the Russian troops. Perhaps Hitlers attempt to take Stalingrad was the boost the soviets needed. If Hitler had of succeeded it definitely would have been bad for moral, but on the flip side of that, an army will tend to fight harder and be more committed when the city theyre defending bares the name of their leader. Good article, good information, especially the order no 227. I think the battle of Stalingrad was incredibly significant and showed the resolve of the Soviet Union to preserve their lands and defend their resources. This again shows Stalin’s strength and influence over the Soviet Union. I liked how this tactic was the complete opposite of the tactic that Russia used when Napoleon invaded Russia. Back then, Russia’s strategy was to retreat before Napoleon’s army, while burning the land and depleting the resources, so that the Napoleon army couldn’t utilize those resources to sustain its army. Russia even abandoned and burned Moscow. When Napoleon finally retreated, winter was setting in; Napoleon ended up losing 90% of his forces. Here instead, the strategy was to give up no land. Both strategies were winning strategies despite being compete opposites, interestingly enough. 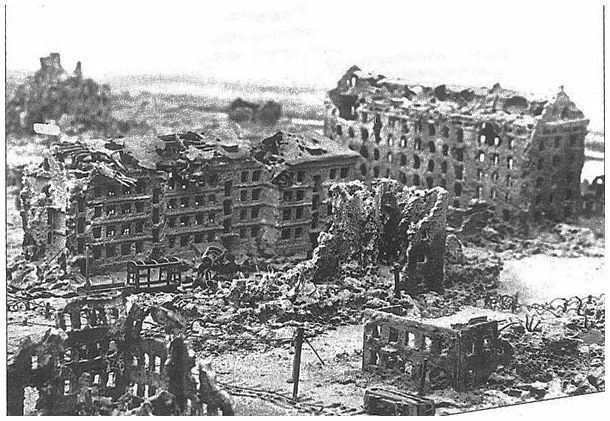 Good article on the siege of Stalingrad. This posts does a good job at analyzing why Hitler wanted to take Stalingrad and how the Soviet Victory managed to create a turning point in the war. To address Steve’s comment, I think Order 227 did motivate the Russian forces. The language in the order inspires nationalism amongst Russian troops and officers. The order tells Russians that it is their duty to protect their country, their fatherland. Therefore, if anyone retreats they are not doing his or her national duty. The order is like a rally for one last stand against the germans. I think Stalin is saying that if they retreat anymore, it will mean defeat and Russians are too strong (in will and numbers) for defeat.